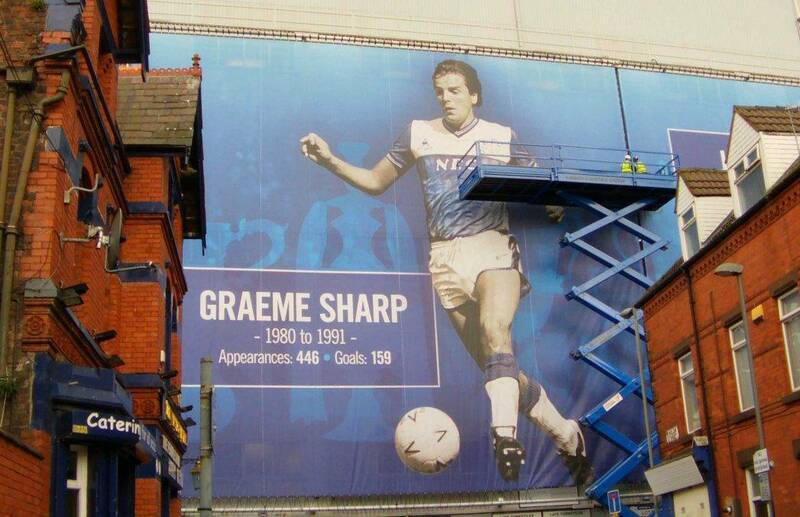 Building wrap Banner system for Everton FC Stadium. 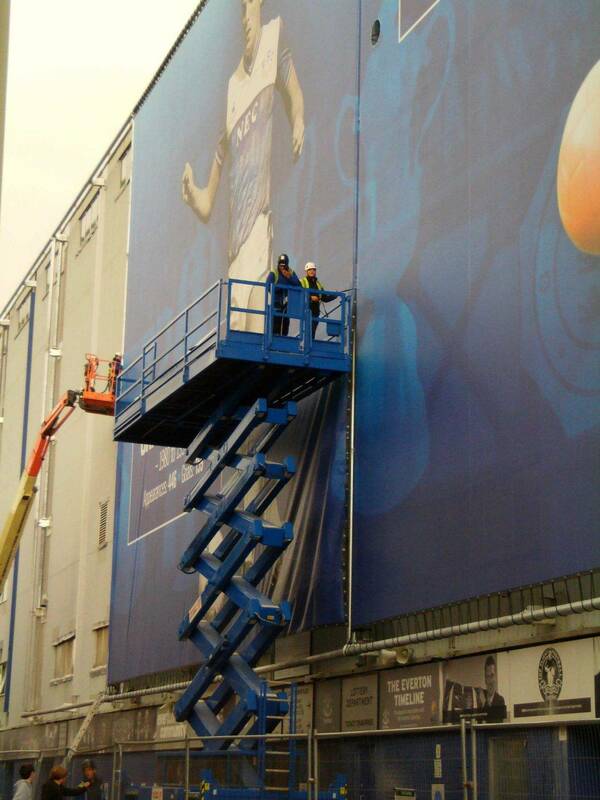 It is not often we get asked to produce a Building wrap Banner system on an entire football stadium. Especially the world’s oldest purpose built football ground and first English football ground to be visited by a reigning monarch King George V on 11thJuly 1913. 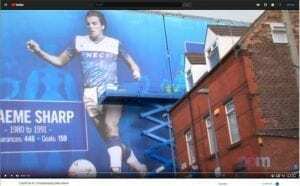 The stadium Building wrap Banner system is part of a refurbishment program for the club as an effective way of brighten up the exterior of the stadium which had become weathered. 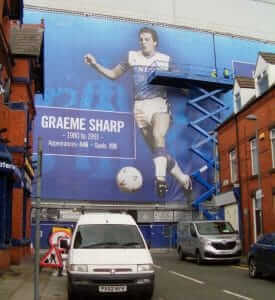 Due to the sheer size of the massive mesh banners planning permission was required and granted. This was not going to be an easy job as parts of the stadium was built in the 1920’s and no technical structural drawings available. As with all of our building wraps windload calculations are required to ensure the main structure we are installing the wrap around banner system on will not fail in high winds. This was handed over to a structural engineer who had to make the calculations and concluded that standard scaffolding poles will not be sufficient. Additional vertical steels also had to be installed so the loading went into the building more equality. Once the wind load calculations had been done the technical drawings were started. 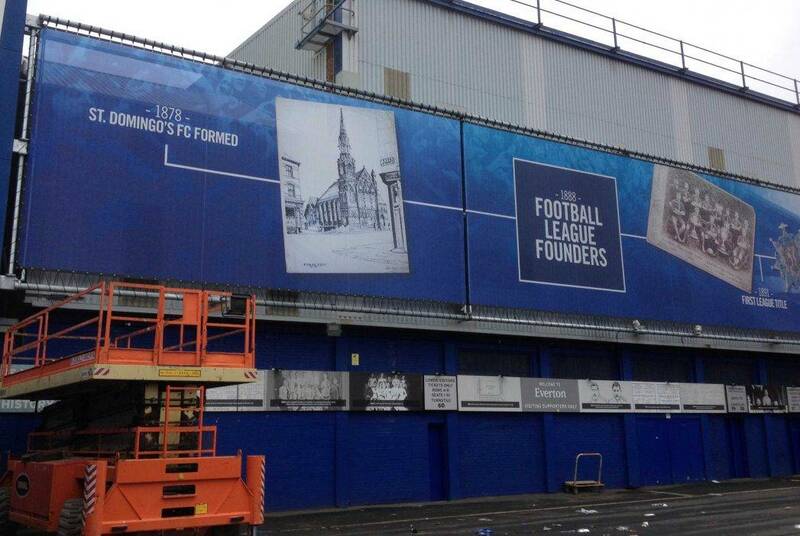 Working together with Shawton Engineering who is the main contractor for Everton FC, and the structural engineer the banner framing system was designed on CAD software. If required at this stage we can put the wrap around Banner system through a computer wind simulation to see how the massive mesh banners reacts under different weather. Once the steelwork for the banner system was installed Project Print management had to survey the frames to produce an accurate template for the artwork designer. Additional as there are extraction air vents in the building, we had to plot out the exact location to cut an opening and fabricate during the manufacture of the banners. 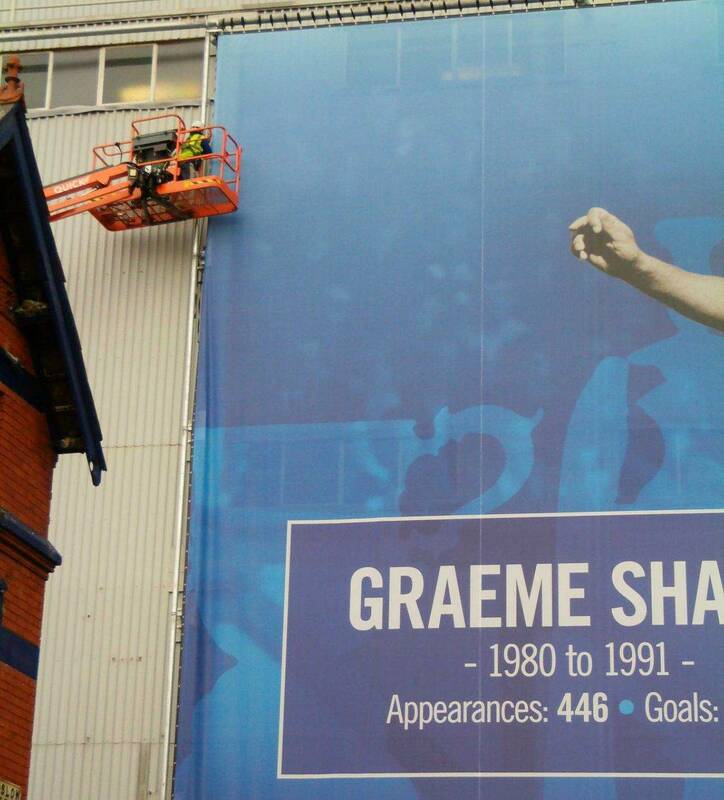 The massive mesh banners were digitally printed on a fire retardant mesh PVC and welded with high frequency welder. 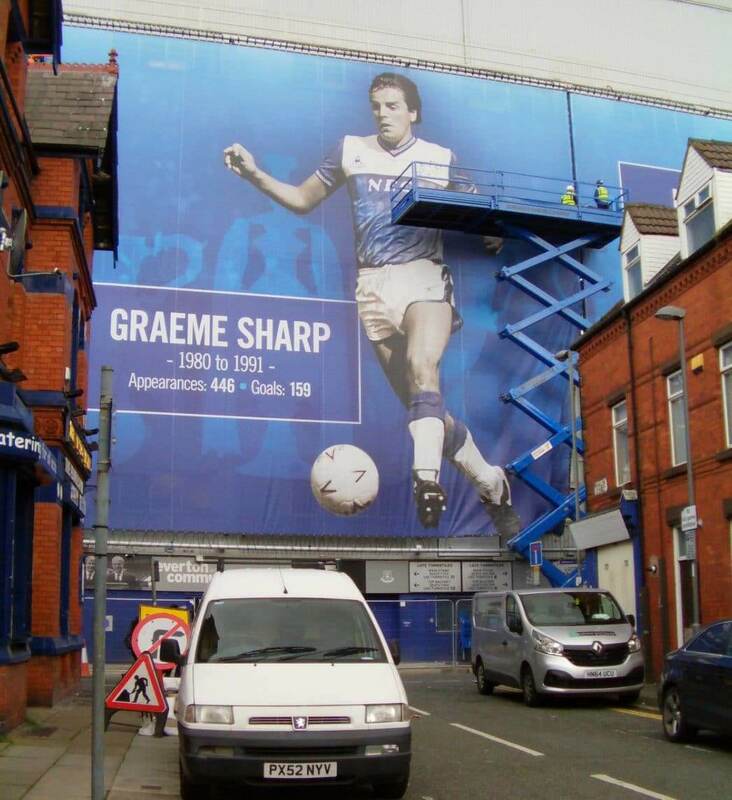 Working closely with the main contractor we co-ordinated the installation of the massive mesh banners using a specialist rope access team highly skilled in the installation of building wraps and massive banners. They either abseil off the roof or use scissor lifts. Due to the scale of this project the installation was over 4 months and typically over winter time. A couple of the installations had to be postponed due to Storm Angus and Storm Doris an issue with installations of this nature. Frustrating all round but we also know that Health and Safety for everyone is at the forefront or our minds. The whole project went without a single glitch and under the estimated budget, confirming the need for Project Print Management. 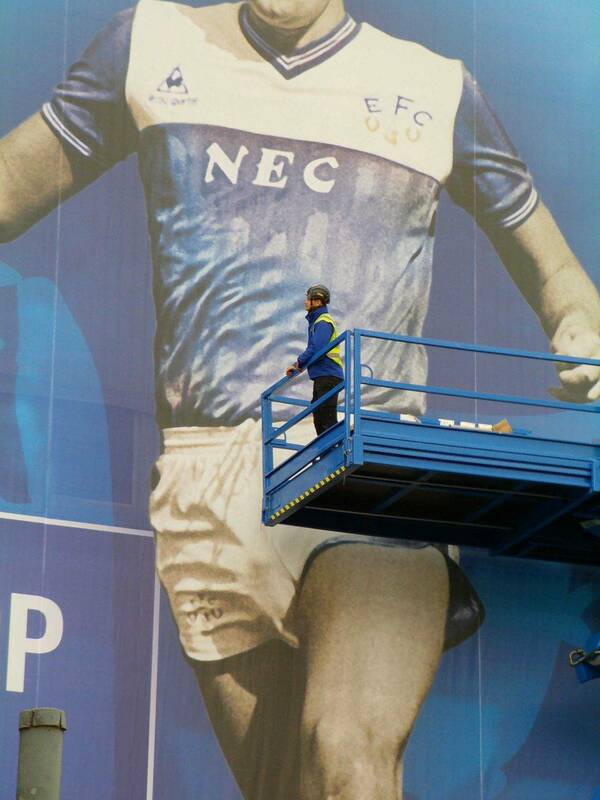 In total there were 19 digitally printed mesh banners totalling over 3700M2 with several companies/people involved. (Client, Main contractor, Structural engineer, Steelwork Designer, Rope access installation, Artwork Designer, Architect, Print Supplier, and PPM). The project went remarkably well considering all the difficult and unknown elements involved. It also proves that when working with professionals with a ‘Can Do’ attitude it’s amazing what we be achieved. Our “can do” attitude and commitment to timely project completion by management and workforce has enabled us to participate in some of the most challenging constructional work in the UK and beyond. 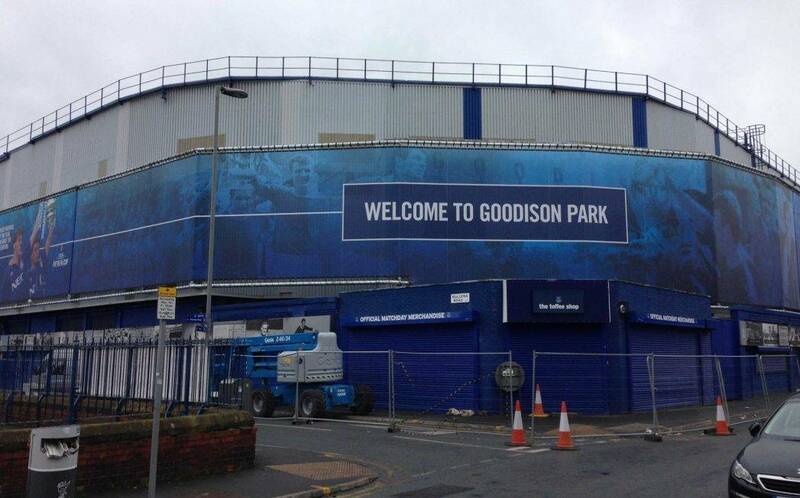 Goodison Park is a football stadium located in Walton, Liverpool. The stadium has been home to Premier League club Everton since its completion in 1892 and is one of the world’s oldest purpose-built football grounds. The stadium is built in a residential area about two miles from Liverpool city centre. For more information on our other print project please visit our blog page.